Assume the person with whom you disagree is just as sensitive, compassionate, informed and faith-filled as you, and that the person is your moral equal. Pay attention to the content of what the other person is saying. Assume the disagreement is personal but instead represents a genuine concern of substance. Use clear, neutral language. Avoid using the word “fact,” but use the word “opinion” liberally. Don’t use slogans or “bumper sticker” language. Focus your attention on identifying the main point(s) of disagreement. No progress can result until consensus is reached about what the real issue is. Be sure to clarify possible areas of agreement. Don’t assume the other person shares your understanding of words, such as moral or justice. Clarify language. Seek a common understanding of all the important words. Don’t respond to emotional outbursts with an outburst of your own. Patience, generosity, and grace are the watchwords. Give reason for your opinion. Avoid appeals to raw authority, conscience or personal experience. Be courteous to those with whom you speak. Jesus knew there would be disagreements among the faithful. He gave an interesting commentary on the Torah (Law) in the Gospel of Matthew when he said, “Moses gave you the Torah (the Law) because you refused to learn from one another…” hmmm. Maybe he’s got something there! Service to others is one of the things that United Methodists have in common. Our denomination believes in being Christ’s hands and feet to the world. That’s why Trinity is so involved in great outreach ministries. Among the programs we support are Share (the local food bank); Martha’s Table (sandwich ministry and more); our mission work in Honduras and beyond; and Crafts for a Cause (creating comfort and care items for hospitals and those with special-needs). Those are just a few of the ways we offer support. This is where you come in. We can use your help with two important upcoming events. 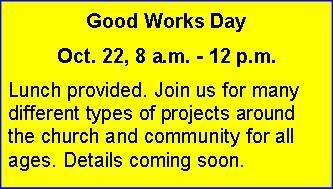 The first is our church-wide Good Works Day on October 22. We’ll have a list of inside and outdoor projects that are needed around the church grounds. We’ll also have projects designed for all ages. 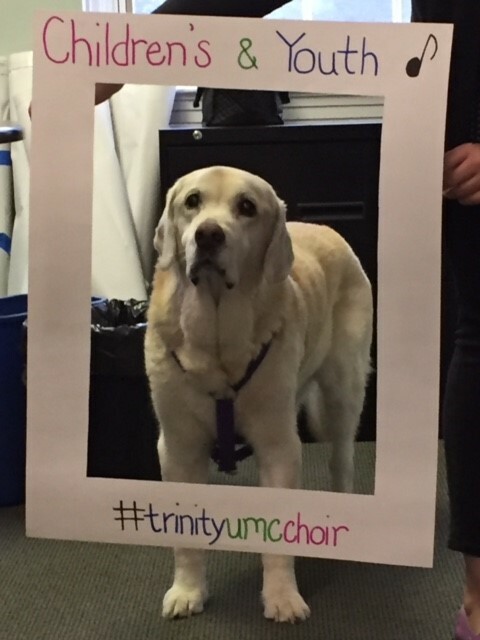 Look for more information on Sunday mornings and on our website, umtrinity.org. Another way you can give back is through Stop Hunger Now on November 5 at Lutheran Church of the Redeemer from 8 a.m. to 4:30 p.m. Trinity is teaming up with people throughout the McLean community to fight hunger on an international level. We’ll help create and package 300,000 meals. Children, youth and adults are invited. To sign up for a shift, go to http://events.stophungernow.org/McLeanRotary2016. 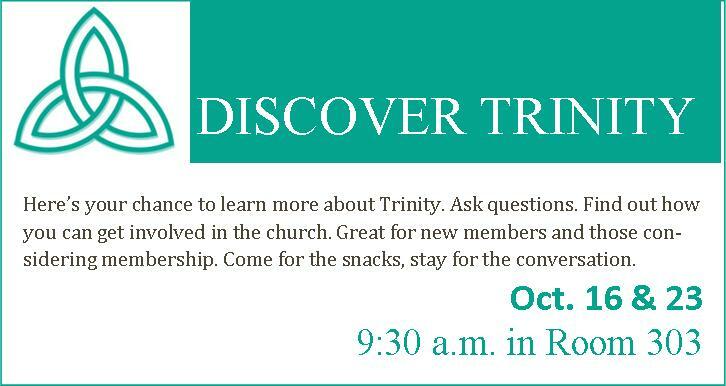 If you have questions about any of the ways you can get involved at Trinity, don’t hesitate to ask Jim, Keith or me. We’re always happy to help. One of the most insightful presentations from a Christian conference was by Pastor Rick Warren, author of the bestseller, The Purpose Driven Life. He said that he was not financially independent because of book sales. Rather, starting from age eighteen he gave a tithe to the church and invested another ten percent. He also maintained a simple lifestyle by living in the same house for the last twenty-two years, driving the same car for twelve years, shopping at Walmart and he has never owned a boat or a plane. By the time he reached his mid-forties, he was financially independent. He did not need to work to make a living; he ministered because he loved it. Later, when his book earnings reached a substantial level, he requested that he no longer receive a salary from his church. It was insightful because Warren’s simple financial advice was completely different from the way I was taught to handle finances. Even though I majored in economics, in terms of viewing finances as a Christian, I was either uninformed or had a wrong attitude toward money. I came home and started reading Dave Ramsey’s book, Total Money Makeover. It was jarring at first because his view seemed extreme. However, I gained insights about some of the money pitfalls that I was falling into. His book helped me to gain a better perspective on financial stewardship. In short, that’s when I realized that I did not adequately educate myself in this area. I only had one rule, tithe to God! That’s good, but I still lacked practical financial education. I’m discovering more and more that this deficiency is found not only in pastors but many others in our society. I’ve read articles by educators pleading for more education on basic finance and investment matters for students in public schools. Thankfully, Andy and Karen Briscoe will be offering a class on one of Dave Ramsey’s books. He wrote it with his daughter and the full title is Smart Money, Smart Kids: Raising the Next Generation to Win with Money. 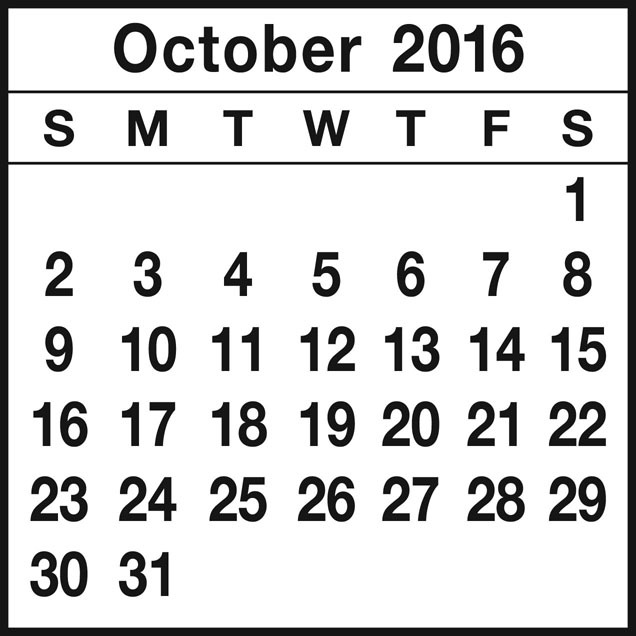 The class will begin Oct. 16 with a ten-minute introductory presentation to parents of our Confirmation 2017 class on Oct. 2 in the Chapel. I’ve observed many who made poor financial choices that adversely affected their lives for many years. Moreover, I did not have the resources to steer them out of those pitfalls. You might not agree with everything that Dave Ramsey teaches, but I believe it will be a first step in helping your family (especially your children) to have a healthy, loving and Christian perspective toward finances. Please plan on joining the Briscoes for this wonderful class. 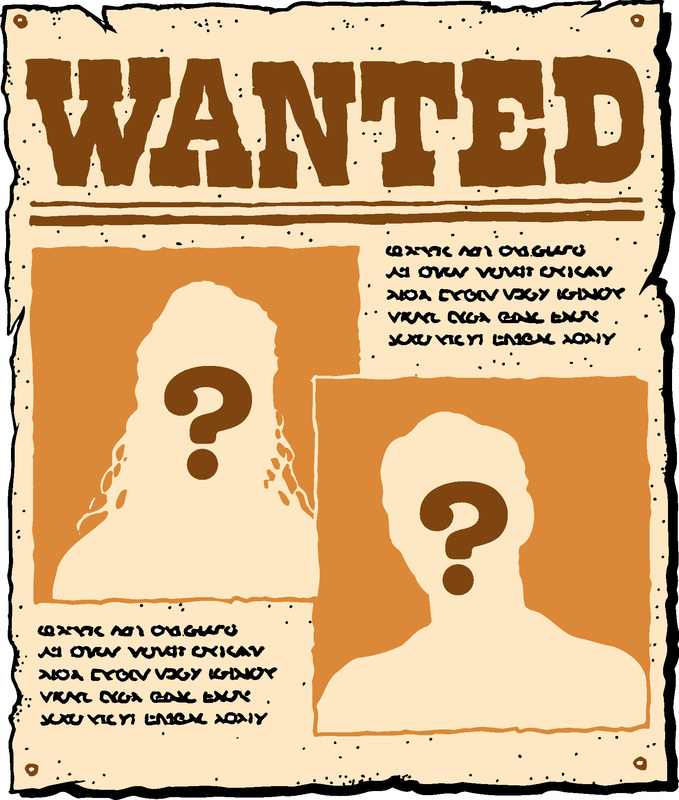 Church & Society Needs You! Our Church & Society Committee does a lot of work for those in need in the Metro DC area and beyond. There are many different ministry areas within the committee, such as Martha’s Table, Christ House, the Children’s Center of Falls Church, and our various monthly collection drives. Each of these areas has a coordinator who reports to the committee’s chairperson. The committee’s chairperson acts as an administrator for the committee by collecting all of the information for the various projects and reporting them to the church through The Spire and Church Council meetings. If you might be interested in being a part of this committee, please speak with Pastor Eileen to find the area that best suits you and your gifts. Who knows, you may be the right person to chair this committee! 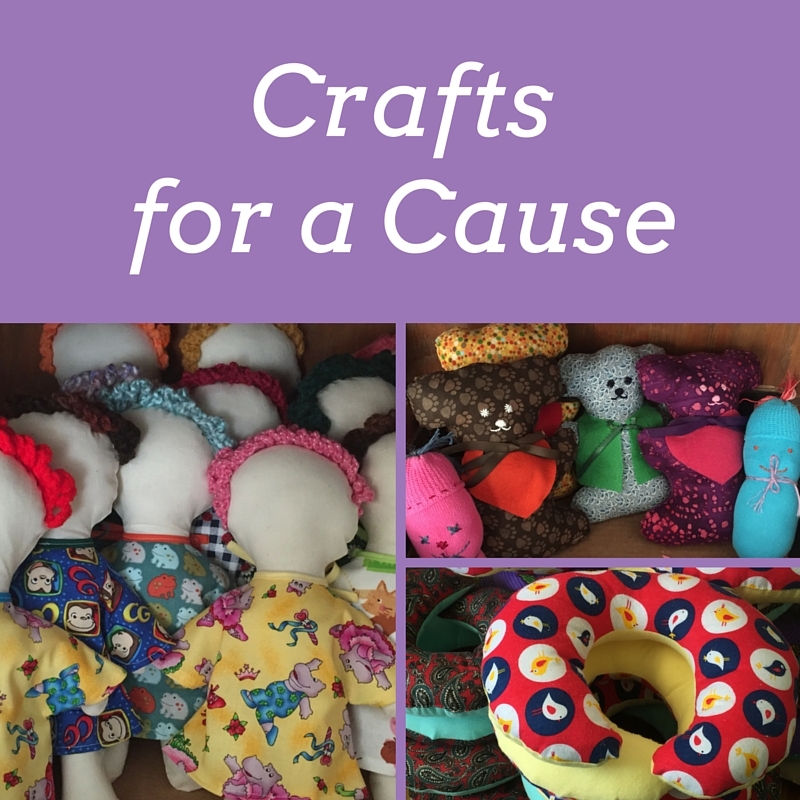 The Busy Season has begun for Crafts for a Cause, as we face down more than 50 yards of red and white flannel, piles of fluffy fleece and a jumbo box of stuffing. You can join in the chaos at our work sessions on Mon, Oct. 10, and Mon, Oct. 24, from 7 to 8:30 p.m. in Room 124. 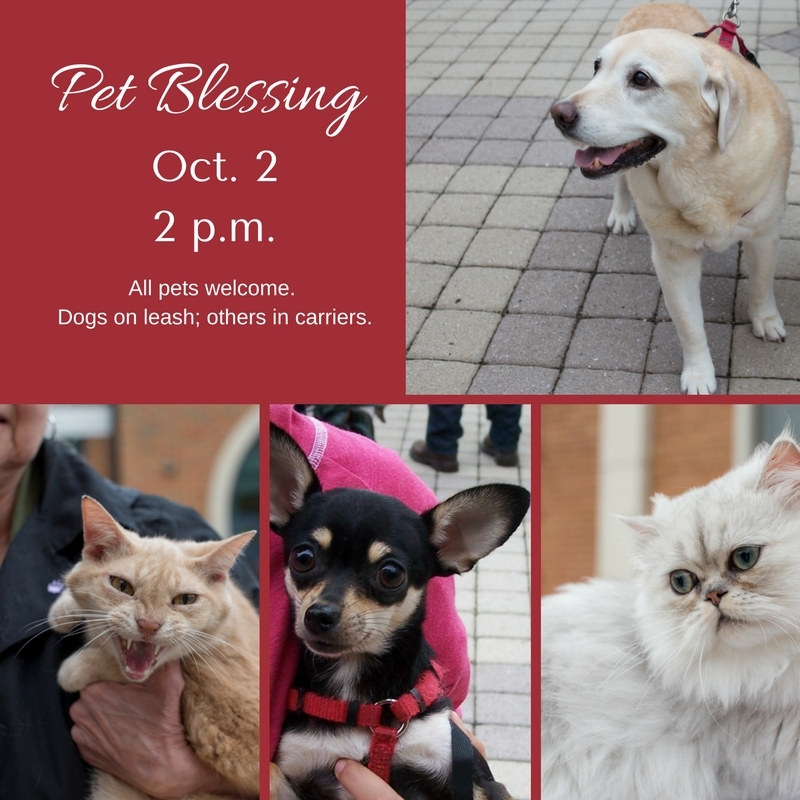 There will also be a bonus session during the church wide Good Works Day on Oct. 22. At all these sessions, we will be working on Christmas stockings for newborns, comfort pillows for chemo patients, dolls and bears for children, and a variety of special projects for the Holiday Bazaar, our annual fund-raiser, which starts Sun., Nov. 20. We are also looking for volunteers who can knit or crochet to help us make Santa caps for newborns at Fair Oaks Hospital. It’s an easy pattern; we’ll provide the yarn. Contact Molly Sprouse, or call 703-356-4896, if you can help. 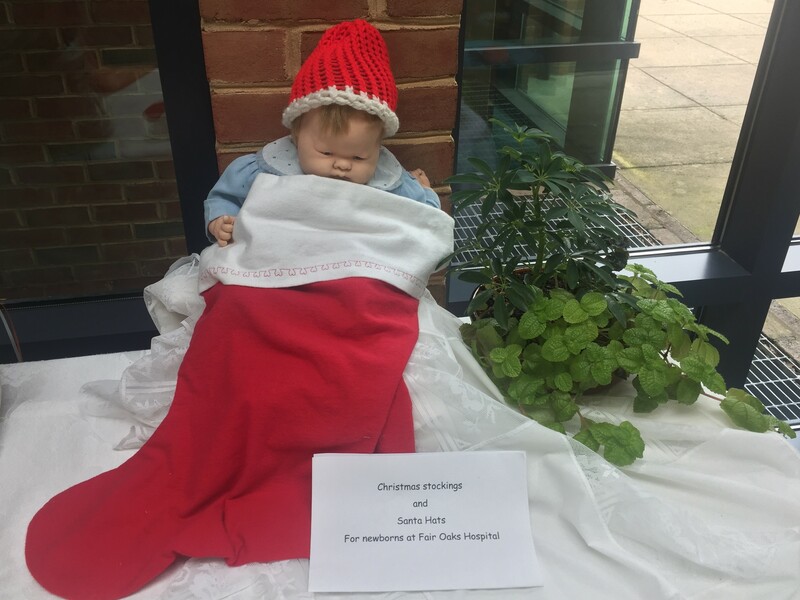 Christmas stockings and Santa Hats for newborns at Fair Oaks Hospital made by members of Crafts for a Cause. 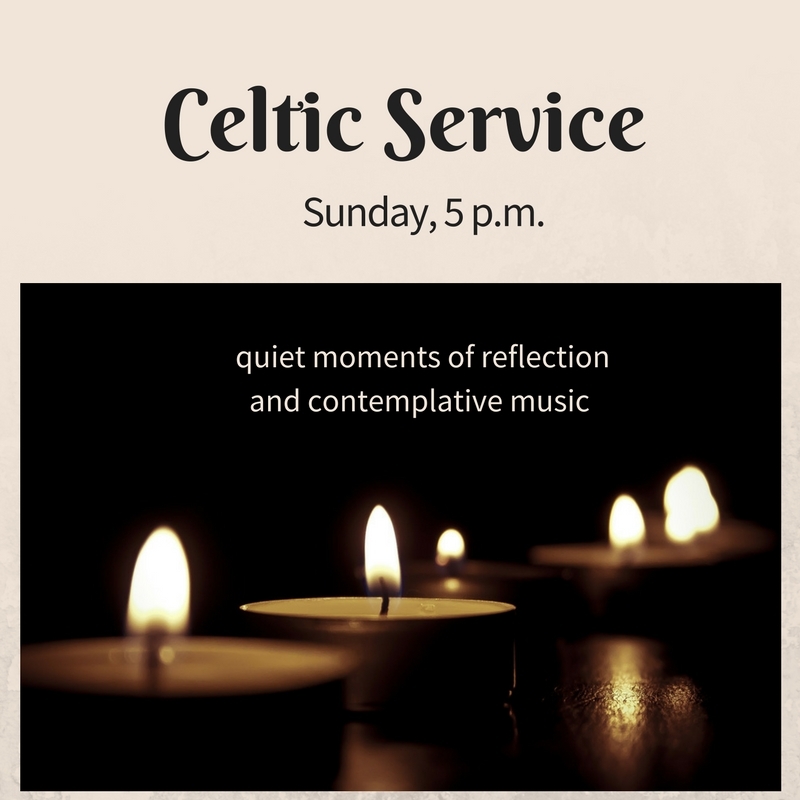 Oct. 30 Celtic Service, 5 p.m. 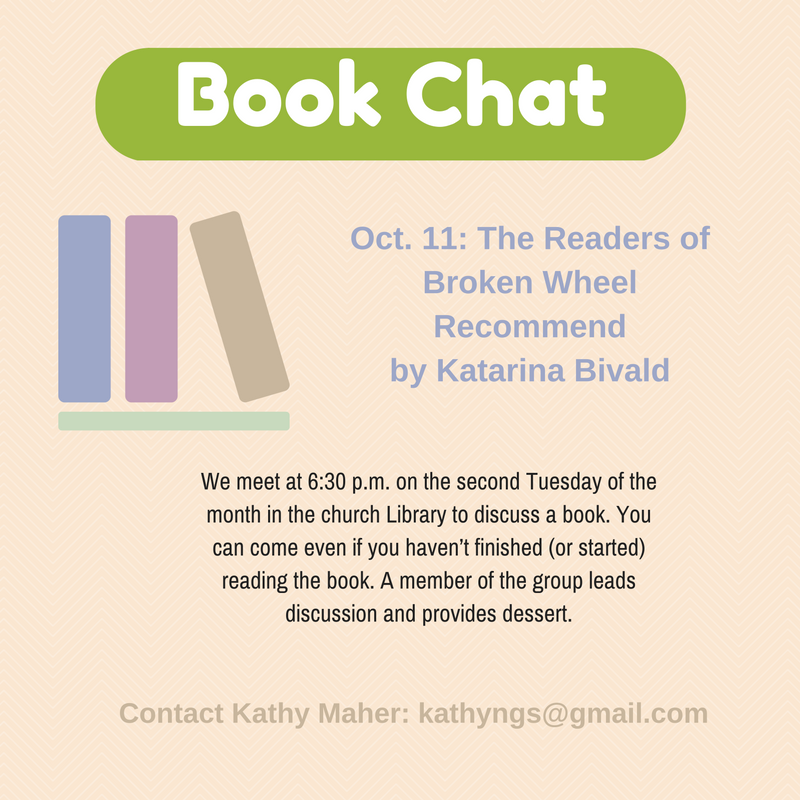 In October the Trinity book club turns to The Readers of Broken Wheel Recommend, by Katarina Bivald, a novel about a quirky small-town bookstore that reminds us why we love books. 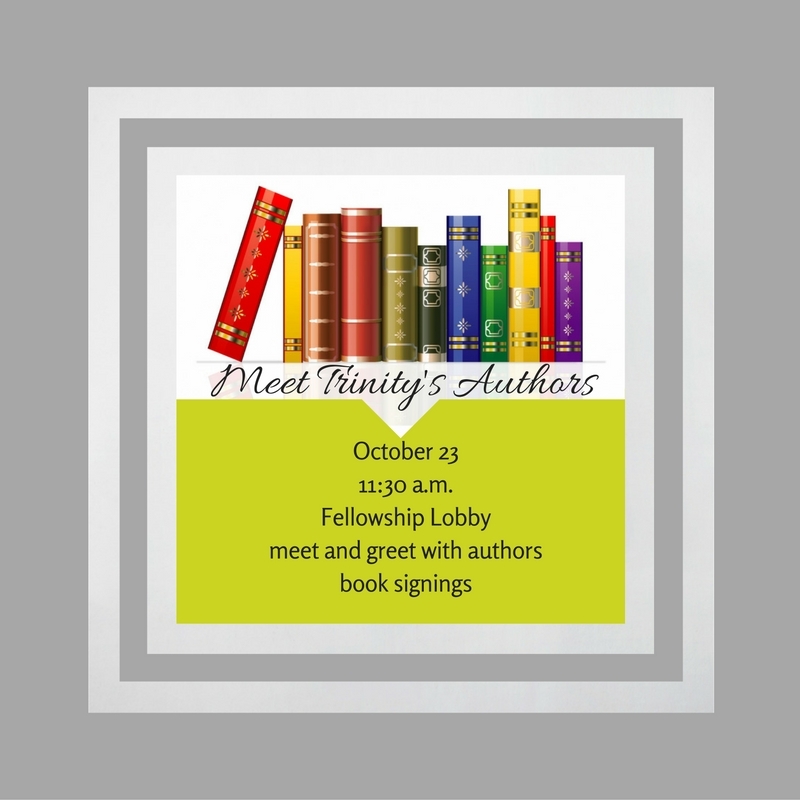 We’ll discuss the book on Tuesday, October 11, at 6:30 p.m. in the Trinity Library. You’re invited to bring a light dinner (dessert is provided) and enjoy fellowship and lively conversation. Our book for November is Bettyville: A Memoir, by George Hodgman. Then we’ll take a break for the holidays! A new photo directory is in the works. This month, we will have photographers at the church to take your photo. Photographers will be here Oct. 11-15. Each family will receive a free 8 x 10 portrait and the option to purchase additional photos. When the printed books arrive, each family will receive a copy, plus an electronic copy for your computer, smartphone or other device. Sign up today for your photos. Signup sheets are available on the table in the Fellowship Lobby and online at bit.ly/tumcphotos. Our Children’s Choir will start its season with a well-known Traditional American Spiritual, He’s Got the Whole World in His Hands. First published in 1927 this song made it all the way to #1 on the Pop Singles Chart in 1958 sung by Laurie London with the Geoff Love Orchestra. This is the only gospel song to ever reach #1 on the Pop Charts. I’m excited for the children to learn this song and to see what movements they come up with for the verses. Our Youth Choir will start working on a new arrangement of a recognizable tune, Beethoven’s Ode to Joy from his Ninth Symphony. The poem written specifically to fit Beethoven’s Ode to Joy is called Hymn of Praise. We sing this hymn often in church. This arrangement takes the classic tune and lyrics and popularizes them with pop rhythms, solos, duets, and trios. This is Hymn of Praise like you’ve never heard it. It will show off the wonderful talent we have in our youth choir and teach them a classic piece of music. Rehearsals for both choirs begin at 6 p.m. on Wednesdays. Now Thank We All Our God is a comforting hymn and classic anthem. Lutheran minister Martin Rinkart, who was inspired by verses from the Jewish book of wisdom Sirach, wrote its original 17th-century German text. Rinkart worked in the walled German city of Eilenburg during the Thirty Years’ War; the city, a sanctuary for war victims, was invaded three times and suffered overcrowding and famine. The Rinkart home cared for the needy despite his own family’s straitened circumstances. During the plague of 1637, Rinkart became the only surviving pastor in Eilenburg; that year he performed over 4000 funerals, including his wife’s. Rinkart envisioned Now Thank We All Our God as a short prayer before meals. By the time the Thirty Years’ War ended with the signing of the Treaty of Westphalia in 1648, it was being widely sung in Germany. The hymn’s stirring tune, attributed to Johann Crüger, was composed ca. 1647 and can be found in several of Johann Sebastian Bach’s church cantatas. Felix Mendelssohn created the now-standard harmonization in 1840 when he wrote his monumental Hymn of Praise; his version is now often sung in weddings and on occasions of national thanksgiving. Our musicians will offer music based on this chorale during Trinity’s October 30 morning worship services; we hope you will join us! 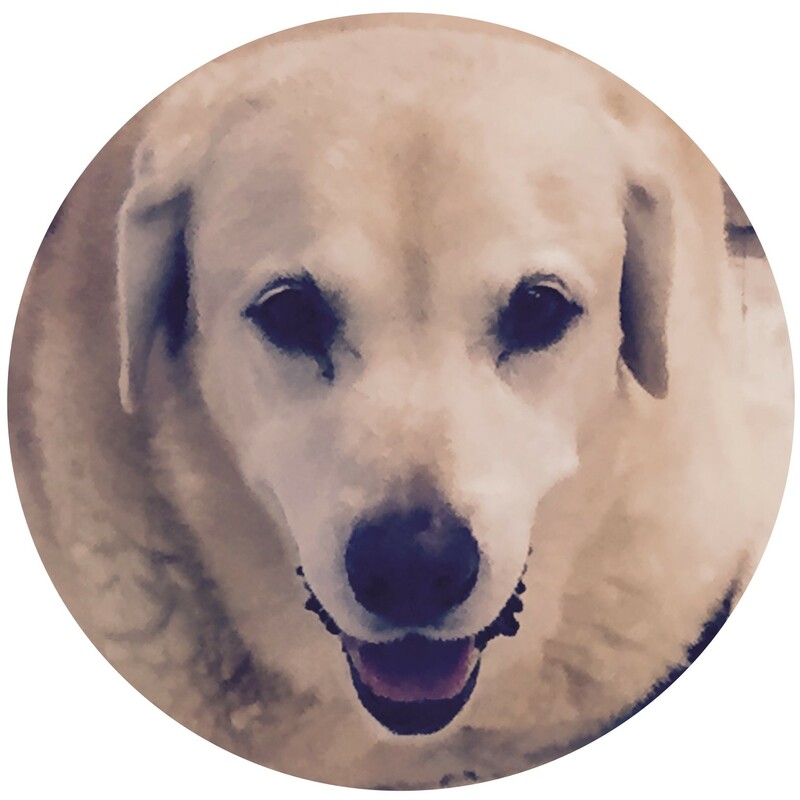 Ask Biscuit: Ready, Set, Read! 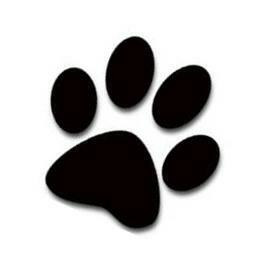 A big hello to all the kids of Trinity! It’s back to school time again. Boy, summer went by so fast. It’s already October. I do have a thick coat, so I’m looking forward to a little cooler weather. Now that you’re at school, you probably have a lot of books to read. You might have a math book, library book, or science book. Those backpacks can get pretty heavy with books and other school items. I’d like to tell you about the book that you can read now, and still be reading it for your whole life. Can you guess which book it is? It’s the Bible, of course! If you have the Spark Story Bible, I hope you are enjoying the stories and all the great pictures. One of my favorite stories in the Bible is the one about Samuel. He’s a boy who is called by God to do great things. But at first, he doesn’t realize who is calling him. It’s an awesome story that reminds us that we are never too young to do things that help others. If you have a Bible for older kids or for adults, you too can look up the story about Samuel. It’s found in the book of 1 Samuel. (When we say the book’s name, we say “First Samuel,” but it’s written like this: 1 Samuel.) It’s called 1 Samuel because there is a 2 Samuel. You can look at your Bible’s table of contents to find the page numbers for each book. Samuel’s story is 1 Samuel 3:1-22. We look at that and see the book is 1 Samuel. The colon that comes after the 3 tells us the verse numbers are next. Now you know how to look up stories in the Bible! Woohoo! The Bible has lots of great stories that can help guide us in life. It teaches us how to love, forgive, help people, and teach others about Jesus. Keep reading! Posted on September 29, 2016 Categories Biscuit/Duke/Henny, Children, Education, WorshipLeave a comment on Ask Biscuit: Ready, Set, Read!